Itinerant rabble-rouser, Timi Frank was once to find himself a better qualifier other than the “Former Deputy National Publicity Secretary of the All Progressives Congress (APC)” appellation by which he is branding himself. The position of “former deputy spokesperson of APC” is not a hereditary title that Frank can hold unto in perpetuity – if he were a mentally viable young man he would have by now occupied other positions by which he would be recognized other than holding to an office he left in ignominy. But finding a correct designation is a lesser issue for Frank as the more pressing matters include him finding a better calling since the space is shrinking for paid activism, the anti-corruption drive of President Muhammadu Buhari government has distressed the market for that unrealistic sector of the economy. Frank must also acquire the skill set needed to survive in his chosen career since he has bungled every single one of his clients’ briefs without exception; even if the anti-corruption war had not depressed the paid activism economy, Frank would have still ended up with a dwindling clientele on account of his shoddy handling of briefs. His attempt to paint one of his co-travelers, Deji Adeyanju, into victimhood is one of his poorly executed briefs. Frank has a poor understanding of the re-arrest of Adeyanju, another paid activist, by the Nigeria Police Force on suspicion of committing sundry crimes was poorly. If his understanding of the circumstances leading to the arrest is poor, his response to it turned out to be poorer while the rant he delivered for his client in respect of the development was totally bereft of logical reasoning. In the bubble he has built for himself, Frank, like Adeyanju, did not appreciate that the paid activist’s crimes were against Nigerians. This lack of appreciation prompted him into shadow boxing and barking up the wrong trees. He fixated on “Vice President Yemi Osinbajo and the Chief of Army Staff, General Tukur Buratai” as the people that ordered the police to arrest Adeyanju. Several things stand out in this mindset that reeks of psychosis. First, the Nigeria Police does not need to wait for instructions, directives or orders from the Vice President to perform its function of crime prevention and it will be even more bizarre if it has to wait for the Nigerian Army or any branch of the military to dictate to it what it should do. Crime prevention and crime fighting are default for the police, it does not have to wait for a petition to apprehend someone that is threatening the peace or safety of other people for instance. Secondly, the Nigerian Army has distanced itself from any involvement in the travails of paid activists that have had to keep dates with the Police. The takeaway from the content of the Army’s denial of responsibility is that Nigerians must learn to take responsibility for their own actions. The era of using the title of human rights activist as immunity to commit heinous crimes is long past so insulting the Army, Vice President or government of the day in the name of being an activist will not shield anyone from answering for their crimes. By the way, freedom of speech, expression and association all have limits. Breaching the limits has consequences for the offender, which could be civil or criminal. Defamation of character is neither a concept in a military rule or democracy but an important ingredient of the law for which parties that feel injured are free to approach the court to seek redress. Freedom of association does not guarantee inaction from the police if the individual exercising the said freedom decides to express it by being part of a criminal organization. Deji and Frank must therefore reassess their situation. If they approach this important assignment with an open mind – possibly free of monetary consideration or intoxicating haze, they will come to the inevitable realization that they need a course on how to go about their activism, particularly when it is the cash and carry genre of activism. They have to admit that collecting huge sums in hard currency from certain opposition figures or state sponsors of terrorism is not enough reason to jeopardize the safety of other citizens. There are worthy role models in whose footsteps they can thread to be successful, and it must not be paid activism but one driven by true altruism. If it took the legendary late Chief Gani Faweinhnmi (SAN) the whole of five years to study law, two years of law school and another three years of tutelage plus decades of service to the people for him to step to the plate as an activist. 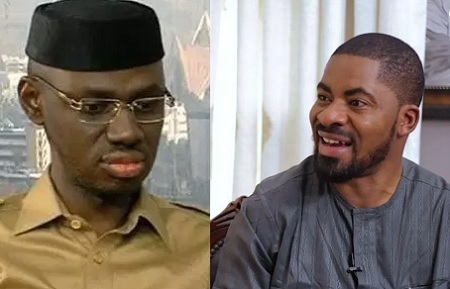 It is then logical that the last three years of Timi and Deji falling out with their political bloc is not enough for them to claim the title of activists yet. There is nothing to qualify both as activists, all they have in common is the crass ignorance of how things work and greed to make money off situations that they care nothing about – they create a toxic mix of ignorance marinated in greed. They have to face the reality that few people take them seriously on account of several factors. Chief among the reasons is that their own brand of activism is paid and oftentimes their clients are well known to the public or at least the signature of whoever is paying them is always written all over the jobs they execute. Secondly, they are known to have been part of the system they claim to protest against when the going was good, their protests or activism kick in only when the sharing formula goes awry. Furthermore, these are individuals with no track records worth recommending to upcoming generations – one only have to think of the trails of blood in Frank’s path in his school days and Deji barely fared better. These are not credentials that stand out activists, they rather taint and make odious. Neither Vice President Osinbajo nor the Chief of Army Staff with his organization therefore needs to set the police on Deji, Frank or any other jobber on the current retainership list of their client. Their records and actions are enough to point the police to red flags even if they were not pretending to be activists. One hopes that this much will be clear to Frank before he embarks on his next rant and Deji before his next prank of trespassing. In conclusion, the greed propelling Frank, Deji and others to engage in paid activism will not allow them repent of their ways so the responsibility falls on the police to sometimes ignore them as mere public nuisance. But where they go beyond their bounds to infringe on the rights of others the law must then take its course. In addition, the police should develop a mechanism of educating other Nigerians to their rights so that they know to challenge these individuals with civil suits that could potentially strip them of their ill acquired money as that would be a disincentive to them and those that want to take up their trade. Kolawole, PhD, a University teacher wrote this article from Keffi, Nasarawa State.